I’ve been on a tear for the last two and a half months. The goal? To break out of the publishing pack with my brand spanking new historical novel Citizens Creek and crash the exalted weekly New York Times Bestseller list.My first novel, Cane River, was an Oprah pick and spent 17 weeks on the venerated NYT Bestseller List in 2001. My second, Red River, grazed the NYT Bestseller extended list briefly in 2007. But my novels are heavily researched and take three to four years apiece to write, and each time I poke my head out of the writing cave, the publishing industry is almost unrecognizable from when I published the last time. 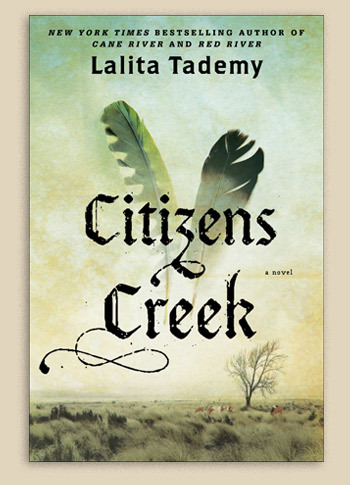 I lost my Atria/Simon & Schuster editor for my third novel, Citizens Creek, less than 3 months before the scheduled Nov 4, 2014 launch, and as a self-described orphan, panicked. At a public function that same week, I heard an editor throw out the number of books an author would have to sell in one week to even have a chance at the NYT Bestseller list. 3,000. Thankfully, she became my adopting editor at Simon & Schuster, and fired up, I launched a guerrilla marketing pre-order campaign, thinking that my best shot at selling 3,000 books in one week would be to “bank” preorders, all of which would ship during launch week, and count as the first week’s sales. I had a fair number of fans from my first two books, as well as friends, and family, and acquaintances, and, as difficult as it was to do, I called on them all for help. And here’s what happened while chasing after a number. People revealed themselves to me, almost always unbelievably embracing and supportive, and only once dreadfully. I met and re-met friends, new and old. I connected with fans. I deepened ties to my family. The odds are against me. I did hit the 3,000 pre-order number, thanks to the good will and creativity and generosity of more people than I thought possible. But the competition is beyond strong, and only the top 16 “win”. The franchise names certain to be on this coming Sunday’s Hardcover Fiction list Nov 16, my make or break week, are on full display. John Grisham. Jodi Picoult. Clive Cussler. Anne Rice. Danielle Steele. Alexander McCall Smith. James Patterson. Ken Follett. Lee Child. The heavy guns. And yet, it is important for me to distribute this reflection before Sunday’s NYT Bestseller list is published, and before I am tempted to categorize my (and your) effort and strategy as winning or losing. I have won, big time. I did everything I could think to do, as did so many of you who believed in me. I am grateful, no matter the outcome. Thank you so very much.